Welcome to McKinley Park Care Center. McKinley Park Care Center is proud to be a five-star, Medicare-certified, short-term rehabilitation and skilled nursing home located in Sacramento, California. 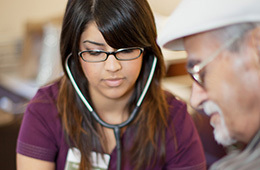 As the premier skilled nursing facility in Sacramento, we provide compassionate, personal skilled care 24 hours a day. We specialize in providing rehabilitation services onsite to help our residents regain their independence. McKinley Park Care Center is a 5 star rated, premier post-acute rehabilitation facility in East Sacramento. We provide therapy services and around the clock skilled nursing care in a comfortable and friendly environment. Visitors are welcome every day of the week. Come see our residents and friendly staff in action. Please contact us to learn more about the unique, sophisticated healthcare environment at McKinley Park Care Center.